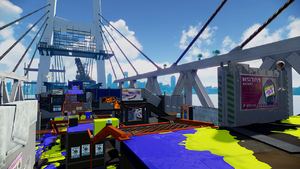 Hammerhead Bridge is a multiplayer stage in Splatoon. It takes place on a bridge undergoing construction, and is a narrow stage featuring grated bridges across the stage's length. Hammerhead Bridge is currently under construction, giving way to many chasms around the map's various platforms. It is split into two layers, a bottom layer and a top layer. The top layer is made up of a Grated Bridge that runs through the map and many platforms. The bottom layer is right below the bridge, providing cover from players across the map, and boasting many ways to reach the top layer. The bridge runs through the map connecting various platforms, making up the "top layer" of the map and overlooking many parts of it. It can be used as a vantage point for chargers in many locations. Players on the bridge, though, are big targets and are vulnerable from surprise attacks from below. The lower platform is right below the Grated Bridge and makes up most of the map. From here, players can work on covering ground and attacking the players above them. The Splat Zone on Hammerhead Bridge is located at the center of the map on the lowest floor beneath the grated bridge. The zone is very long and narrow, spanning almost the entire width of the stage. Because the grated bridge crosses over the zone, players on the it will be huge targets from players below, as there isn't too much cover from below. Two small walls have been taken out near the center and three barriers have been added. The tower in this map is located on top of the Grated Bridge and it's goal is located two platforms down from each team's starting areas, below the bridge. While someone is riding the tower, it will first travel to the right of the riding team a bit and start going forward on the side of the bridge. Once it reaches the bridge's edge, the tower will then go down to the ground and continue traveling right again, ascending to the top of the small grated platform there. Upon reaching the top, it will then go forward a bit and take a left, heading back towards the Grated Bridge. The tower will start to go down the side of the wall and continue traveling forward towards the goal. The Rainmaker starts in the very center of the map, on top of the Grated Bridge. The goals are located in front of each team's base, with an added barrier closer to their respawn point. Many stacks of inkable crates have been added to provide more ways to attack the opposing team and get inside their base. Hammerhead Bridge was revealed during a Japanese promotional trailer depicting new updates on 24 July 2015. It was released on 18 September 2015 at 02:00 UTC. A Slosher-user throwing ink from up high in Hammerhead Bridge. A Charger-user firing through the grates of Hammerhead Bridge. A Rainmaker match in Hammerhead Bridge, fighting for control. Several Inklings fighting for the Rainmaker. An Inkling preparing to fire the Rainmaker. An Inkling with an Inkbrush looking at some items left around Hammerhead Bridge. One jellyfish reaching down to another at Hammerhead Bridge. Fireworks seen from Hammerhead Bridge. The map's name is a reference to the real-life hammerhead shark. It is also likely a reference to Hammersmith Bridge in London, England. Before it was released, this map was featured in promotional images from the release of the Rainmaker Mode. Many miscellaneous items are left around Hammerhead Bridge, such as gloves and cans. These are presumably left by construction workers. At Hammerhead Bridge's release, there was an area near both Spawn Points from which the player could drop below the stage and stand on the beams supporting it. If they were splatted there while holding the Rainmaker, it would return to the last beam they stood on instead of back up in the stage itself. This was patched in Version 2.2.0. Jellyfish can be seen on top of the bridge to the right and left sides of the stage. The internal codename for this stage in the game files is "Kaisou", from the Japanese 海藻 (かいそう), "Seaweed". ↑ Splatoon JP on Twitter. Splatoon Japan (2015-09-17). Retrieved on 2015 September 17.